Breaking into the apparel industry can bring a tidal wave of stress and emotions for those running a small business. In a sea of success and failures, one thing we all can do is man up—buckle those belts and submit to the fact that we’ve all got to start from the bottom and work our way up. Luckily, Jayne Min, consultant slash stylist and founder of the hit website Stop It Right Now has some words of wisdom to help. The OC native gave some great advice to WhoWhatWear about staying professional, finding inspiration and looking good while you climb that ladder. At times, it’s easy to see others who’ve had success and assume that they must have had things handed to them on a silver platter. You spend hours raking your brain–trying to figure out how you can win big and start swimming in the fame and glory and the Instagram likes and the beautiful designer shoes…Okay, come back down to Earth. It’s important to know that these thoughts are toxic and counter-productive. “Don’t assume that there’s a fast track for everyone,” says Min. “But don’t get discouraged if things don’t unfold smoothly for you. Pay your dues, don’t cut corners, stay humble…and always ask questions.” Recognizing that others have worked hard for what they’ve achieved will inspire you to do the same! Sometimes finding inspiration for design is as easy as looking to the other aspects of your life where you find passion. Art, biking, pop culture, cooking…we’ve had many customers who now run hugely successful children’s lines because they were so sparked by being a parent! “Growing up, the only other thing I was into besides making clothes was skateboarding,” explains Min. “My two interests—skate and fashion—inevitably fused into a career designing apparel in the skate industry.” Finding others with the same interests and experiences as you is a great way to make sales because your customers will be able to relate to your brand identity. In these retail-saturated times, the only way to effectively create a lifestyle brand that appeals to the masses is to serve a customer base that already exists! Being your own boss, it’s easy to fudge your work schedule a little bit, or work less consistent hours because, well, hey you’re the boss! But a better strategy for success is to set specific hours and stay focused. Min’s quick tip: swap out the clock on your phone for a classic, dependable watch. “You look at your phone for the time, but then there’s a notification, then your friend sends you an article, and next thing you know, you’ve already forgotten why you grabbed your phone in the first place.” She’s right—we’re all guilty and this little morsel of advice will save hours of lost time. Its common sense that eliminating distractions will keep you on task–and the phone is probably our biggest downfall. 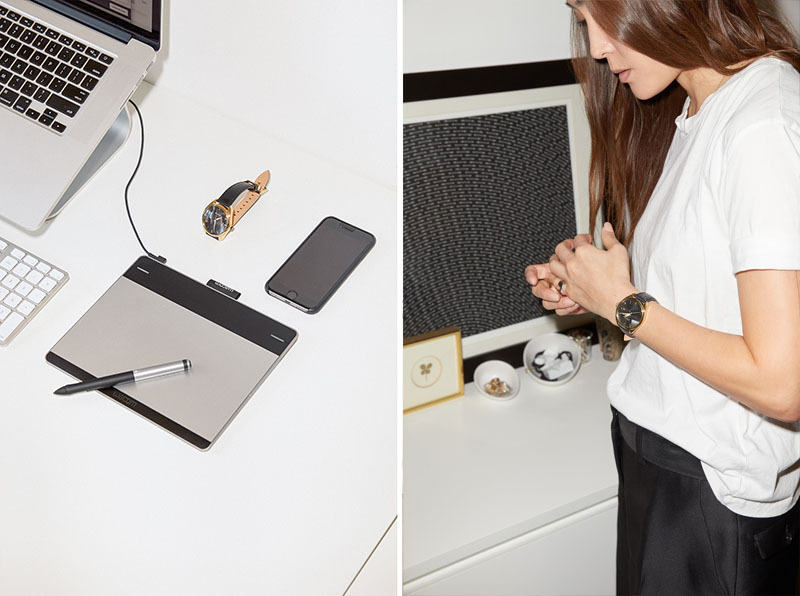 Min’s picks: the Nixon Kensington Watch and the Nixon Bullet Watch.